Because of a health condition, your Doctor may order a blood thinner medication for you. For example the Doctor may order coumadin, levonox, or heparin. With these medications you would need your Prothrombin Time, International Normalized Ratio monitored often. Normally, you would have to make many trips to your Doctor's office for lab draws. Often this could be 2-3 times a week. WE HAVE A BETTER PLAN!! 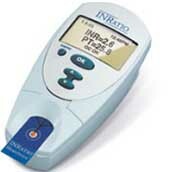 You can have your PT/INR monitored in your home, with no lab draws!! The HemoSense® INRatio® meter for PT/INR self-testing is a convenient, portable and user-friendly system that enables our staff to monitor patients coagulation status at home. With INRatio, we can check your blood regularly and eliminated the need for you having to traveling to and from appointments and without interrupting your busy schedule. This easy-to-use meter gives accurate results in two minutes with just one drop of blood and allows you to be more actively involved in your health and treatment.